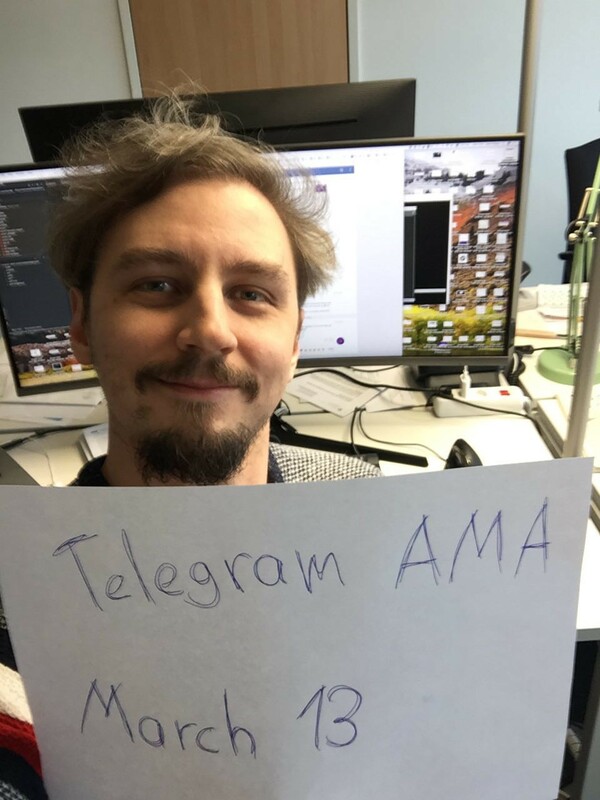 On the 13th March 2019 we held a LIVE Telegram AMA with Streamr CEO, Henri Pihkala. Questions covered a range of topics, from the current state of the project, partnerships, DATA tokenomics, marketing , and what lies ahead for the team and decentralised data space. @ psycrypt— Q: My question is are any major partnerships in the works that will in future be using the DATA token? Henri — A: There are major partnerships in the works, some of them targeting the public network and some of them experimenting on a private environment copy, or a hybrid of both. Obviously the ones targeting the public network will be using the DATA token actively (to the extent it’s currently and in the future used in the Streamr ecosystem). Involving the token in the private networks too is something we’re figuring out, as it’s not naturally present there. There might be some bridging solutions that are feasible for making that happen, if it makes sense for the use case. As Streamr is open source, anyone can of course create their own copy of Streamr and use it internally, and in many cases this will probably be a stepping stone towards the public network, as only the public network can provide the network effects, robustness, and the benefits of having the public Ethereum blockchain on the side for value transfers. @ einstanio — Q: hello @hpihkala, when will the new graphical interface be available? Henri — A: The reimplementation of the frontend is almost ready, with some polishing and loose ends still remaining. All the resource control pages (creating streams etc.) are pretty much done, and the Editor is fully working with some of the custom modules (visualizations, subcanvases) still needing a bit of work. When we get this out, it will be SO MUCH easier to maintain as everything is now nicely written in well structured React/Redux instead of the previous-generation code. @ JackFriends — Q: I was wondering if you could tell us a bit more about the Trackr project. What is the current focus of the project and can you update us on the development status? Henri — A: So Trackr is a kind of demo app we developed for a couple of reasons: So far it’s served as a kind of pitching tool to demonstrate how data can be produced to Streamr and made available on the Marketplace. We’re looking to continue developing Trackr to by adding the Community Products features once that stuff is ready. It will serve as a proof of concept, a demo tool, as well as template for others to build different kinds of Community Product integrations. We don’t expect the Trackr app to become a product in itself in terms of, you know, hundreds of thousands of people installing it on their phones. That is out of focus for us, and would be a sizable effort worthy of its own project and funding. Instead, it will help us open the conversations with the ones we’re really interested in engaging: the app and gadget makers (we’ve used Fitbit and Tesla as examples, not implying any relationship with either) who already have a large install base for their related apps, and could easily ship the Community Products integration as part of their app to large groups of people. @ CoinUSD — Q: Where can I see your roadmap? And what immediate development plans await us? @ CoinUSD — Q Will there be new exchanges in the near future? Henri — A: Exchanges are semi-actively in touch with us, and vice versa. Since discovering the findings of the Blockchain Transparency Institute (https://www.blockchaintransparency.org/) we’ve been a little less eager, as most exchanges seem to have mostly fake volume. The clean ones include Binance and Bitfinex, both of which DATA is already on. The remaining big and established exchanges with reasonable organic volume are the most interesting ones we’d like to see DATA on next. @ CoinUSD — Q: How does your marketing department work? How many people are currently working in it? What about the Asian markets, are you working in this direction? @ CalvinKleinVN — Q: Are you connected to any business in the near future, such as samsung, …. Henri — A: We are actively talking with a number of businesses. Unfortunately much of that work is behind closed doors at least until there’s something concrete to publish and talk about, as the big enterprises always tend to start out stuff in secrecy legally protected by NDAs. So this process will take time to lead to meaningful announcements. We also evolved our partnerships strategy a bit since last year, turning the focus on these big and meaningful (but secrecy-oriented and slow) partners. Last year, at the height of the overall blockchain hype, it felt like everyone and their dog wanted to partner with us for the PR benefits of “hey look, we’re active in the blockchain space” for them, but those connections often didn’t lead to anything real, and we were wasting time chasing red herrings. So we wanted to focus on developing the concrete stuff with serious parties instead of chasing hot air, and I think it was the right move even though it means we don’t have weekly new partnership announcements (actually if you see that from some project, it is quite likely hot air, since no one can possibly do something reasonable with such a boundlessly growing crowd of partners). @ nolik12 — Q: Hello, Henri. As I know, you’ve been working on Streamr for many years before ICO happened. Do you think that now people care much more about their personal data than before. Who do you think will be your target audience, b2b or b2c? Thanks! Henri — A: Yes I think that’s the tendency that people care for their data more, thanks to the numerous scandals over the past few years. But the purpose of Streamr goes beyond that: I think it’s time for new data infrastructure altogether, with so far the cloud giants having a power-play position in the space. Almost all of the (web, mobile, etc.) applications in the world depend on one of: Amazon, Google, IBM. This is crazy! Ethereum has shown the way for dapps, but the blockchain is just on layer in a stack of decentralized services eventually replacing the cloud services everyone uses today. The vision of Streamr is to be the real-time data layer of that stack. In addition there will be decentralized computing (Golem etc. ), decentralized file storage (IPFS, Swarm etc. ), decentralized databases — all the things you expect to find in a cloud service stack. As Streamr is a platform, it doesn’t directly target end users (B2C), but instead the goal is to help others improve their business, so definitely the direct relationships are more B2B. With Community Products this easily extends to B2B2C, where businesses that build consumer apps and gadgets can enable their users to monetize data. The incentive layer for the Network, involving DATA, is something we’ll tackle a bit further in the roadmap. So apart from preliminary ideas, we’re not really diving deep into that just yet. However already in Milestone 1 we originally planned to have a simple use for DATA in the Network layer. It doesn’t mean rewards for running nodes (since nodes can’t be run by outsiders yet), but instead the Network could require DATA ownership from the Network users. I don’t mean payments, just having DATA, kind of as a proof of stake within the ecosystem. I think it’s a pretty lightweight way to start the journey towards involving DATA on the Network level. We need to remember that if introduce too big changes in how the system functions, we always risk dropping some users who can’t keep up with the changes. So also the road to building the incentive mechanisms need to happen step-by-step instead of all-at-once. - Adding the incentive layer to add rewards for those who run the nodes. @ drnkac — Q: Hello Henri. What share do you believe can Streamr get in the overall data market in future? Henri — A: I think no reasonable and accessible data economy in the global scale exists just yet, apart from internet advertising, which of course enabled Google, Facebook, and Twitter to operate. The only way to build such an economy is to build an open and neutral protocol, which we’re trying to do. In many senses we’re very early with this, and the whole concept of data sharing and monetization is still unfamiliar to many businesses and individuals. But I think the market is slowly starting to emerge, and the mind shift in organizations is starting to happen, and it would be difficult for a centralized party to own the market because it would also mean that they own and control all that data, which would be a nightmare for the people and businesses involved. So obviously it’s hard to make predictions about a market that doesn’t really even exist yet, but might in a few years. I can’t know about market share, but I do think we’re in a position to become one of the prominent technologies to be used for collectively making the data economy happen. @ Bonjovo — Q: Does this also mean that (some of the) announced partners in 2018 are not serious anymore? Henri — A: I think they are serious and ongoing, but not everyone is equally active to push things forward all the time. In my experience such collaborations tend to advance at varying pace, so there might be seemingly passive periods of time, then things suddenly leap forward again. We’re also concentrating our own efforts towards the collaborations that seem most active and those who are interested in building something concrete with our technology (which in all fairness is still developing). @ daochemist — Q: In a perfect world, what does StreamR looks like 2 years from now? Henri — A: In 2 years I hope there will be an active ecosystem of businesses and individual developers using Streamr technology in their solutions, and at least a few interesting “killer” apps built on top of Streamr or killer data products on the Marketplace. Streamr will have taken major steps towards full decentralization by releasing the next two Network versions, and has become the go-to protocol for real-time data. In the overall blockchain ecosystem, many of the current UX issues and especially fiat on-ramps have hopefully been solved, also making our job easier especially with the Marketplace. I also hope that blockchain scaling will have been solved, although it isn’t really limiting what we intend to do in any serious way, at least not yet. But we’ll be able to move more and more of the currently centralized application logic and stream metadata onto the blockchain, if it becomes more scalable and cheaper for users to interact with. Within organizations, crypto assets have hopefully become more familiar and acceptable, making them more comfortable with holding and using various crypto assets. I also hope that tokenization of securities (such as company equity) has had a breakthrough and that DAOs gain legal entity status in at least some jurisdictions, making new types of crowd-run and crowd-owned businesses possible. @ CoinUSD — Q: What is the use of tokens and what ways to spend it in the future? Henri — A: So far the tokens are only a means of payment on the Marketplace. They will also have a broad range of functionality on the Network level, and this will be shipped in stages starting from simple token stake checking to a more complicated incentive mechanism enabling node rewards. On the Marketplace the role of the token will also be extended to influence a product reputation system (for example, products with more volume or with larger DATA holdings by the seller can be shown higher up in product listings). Perhaps one more thing to point out, although a sub-use case of payments on Marketplace, will be Community Products, which will enable individual end users to earn DATA for contributing data to collaborative data products on the Marketplace. @ remykonings — Q: Hi Henri, what is your view on the tokeneconomics of Streamr? This relates to the use of DATAcoin and some discussions from a while back here in the chat, where suggestions were made that perhaps ETH was another viable option on the marketplace. I like to know how you look at this and how you can assure the community about DATAcoin and it relevence. So we’re kind of adding a conversion layer to enable people to purchase products even if they don’t have DATA but have other crypto assets. This combined with a proper fiat on-ramp would be amazing, but this is something people are still trying to solve. Imagine being able to come in with a credit card, use that to easily buy ETH, and then use that ETH to automatically swap to DATA in order to buy a product. That could be made really, really easy for the user if the fiat-to-crypto didn’t require all the KYC hurdles. @ cinnamal — Q: does Streamr already earn revenue at this point or does the company rely 100% on the funds from ICO token sale? Henri — A: Streamr is a crowdfunded open source project, with a predefined scope and funding raised to execute that predefined scope. So in that sense we aren’t really seeking to generate revenue as a traditional non-crypto startup would. Instead the “business model” is based on the token economy: the people building the project hold the DATA token, and if we are successful in creating the technology, that may lead to more demand for the token, which in turn may lead to appreciation of the token price. So this is how the current entity can get rewarded for delivering the project. Important: As always with public statements about the token mechanics and company/contributor incentives, I am required to say all these things: none of what we say is investment advice, DATA is not an investment vehicle, its price can go up or down equally likely, you WILL lose your money, etc. Commenting on the possibility of revenue-based business around Streamr: it’s important to realize that ANYONE (includes all of you!) is free to start a business that builds products or offers services based on the Streamr technology, as it is open source. We’d be delighted to see more and more of this happening. Building such businesses is actually essential to ensure the maintenance of the platform beyond the initial project duration of ~5 years (of which we’re now less than 1.5 years in). We’re looking into setting up a services entity to serve the ecosystem by answering to the requests we keep getting (“hey, could you guys help us use Streamr to build X”). You can do this too, and we hope you do. All of that helps to deploy the Streamr technology and to ensure Streamr exists from now until eternity. - In expanding buyer options on the Marketplace, buyers could use ETH but the sellers will still receive DATA. - The token will have various other functionality than just a means of payment on the Marketplace. @ daochemist — Q: I’m new to StreamR, but I’ve heard some talks of a Broker node, as in a masternode, is that also in the works for the use/value of DATA? Henri — A: Yes, broker nodes are the nodes in the Streamr Network relaying and optionally storing messages. This will enable you to contribute your spare bandwidth and storage to the system, and let you earn tokens for doing so. This will only be possible once we get to the stage that allows us to add the incentive mechanism. Before that we need to do a few other major things on the Network level, such as finish the P2P stuff we’re currently working on, and set up end-to-end encryption so that data confidentiality is guaranteed even if nodes are run by “untrusted” parties (as opposed to us running them ourselves). @ luckcat — Q: Has the team’s existing funds exceeded data market cap? Henri — A: Yes — not uncommon during the current “crypto winter”. One of the ways to NOT end up there is to mess up your funding by taking too much crypto risk, which many many projects did, and are now suffering from it. Luckily, we were conservative in our treasury management and currently have the full project funding in fiat. The project is safe. For the full transcript, head over to our Telegram and read from 13:30 GMT 13th March 2019. Thanks for your questions and see you again soon!